At Gartly & Associates we specialise in working with small to medium size businesses. As qualified Chartered Accountants and business advisers, we have earned the reputation of giving advice beyond just the numbers. Our goal is help you grow your business by interpreting the numbers. We then help you use those insights to make informed, strategic business decisions. Gartly & Associates was founded in the year 2000 . We have been advising small business clients drawing on our combined many years of business experience offered through the company’s Director and our professional and ethusiastic staff. We’re focused on being an exceptional accountancy practice that provides practical, affordable and professional business advice to enable our clients to grow their businesses, increase their personal wealth and gain more pleasure from their lives. Gartly & Associates works with diverse businesses ranging from builders and property developers, IT and e-businesses, tradespeople, medical professionals, retailers, tourism and hospitality venues and more. Gartly & Associates has been advising small business clients since the year 2000. Our clients enjoy our combined many years of business experience offered through the company’s Director and our professional and enthusiastic staff. We’re focused on being an exceptional accountancy practice that provides practical, affordable and professional accounting help and business advice to enable our clients grow their businesses, increase their personal wealth and gain more pleasure from their lives. Gartly & Associates works with diverse businesses ranging from builders and property developers to IT and e-businesses, tradespeople, medical professionals, retailers, tourism and hospitality venues and more. Gartly and Associates has looked after my tax returns for the past 10 years. I have found them to be very diligent and professional in their work. Geoff and Vicki are very caring people and work to meet your individual needs. They provide prompt advice and services and I highly recommend their business. Jono and I have enjoyed working Geoff, Vicki and team over the years (I think it’s around 15 years!). They are always accommodating and have been able to suggest some innovative ways of us minimising our tax. We have confidence in knowing they are always across the latest changes and even remind us when we need to come and visit. Gartly and Associates have been my accountant for over 13 years for my business and private accounting. They have always been friendly, professional and helpful. We have been with Gartly & Associates for a couple of years now and are extremely happy with the service. Geoff’s approach is always encouraging and supportive, and we find his advice invaluable. We have had conservative accountants in the past and Geoff is the opposite. He is always open to our future plans and helps us crunch the numbers to assess viability. Geoff and the staff at Gartly & Associates are great. We have been using Geoff and his amazing team at Gartly and Assoc for over 11 years and have nothing but great things to say about them. They have grown with us as Matthew's business have evolved, giving relevant and practical tax advice on how to best maximise benefits. They have moved with us as we have changed as a family, as I have changed jobs and industries. It has all been seamless and their prices have always remained fair and reasonable for the work they do for us. They are always available and helpful to answer any questions or issues we may have. They make an effort to empower you with latest accounting practice that impact on your taxes or business which is great. One of the greatest things is that they are always friendly and do get back to you when they say they will - this ensures trust in our relationship with them. Couldn't recommend them highly enough to anybody needing the services they provide. Geoff and his team have been our accountants for over 10 years, during that time we have had various events that required some expert advice and Geoff has always been a valuable advisor in supporting us to make the right holistic decision. The team are friendly, customer centric and responsive and we always feel that we are number one no matter how busy the team are. Geoff has a genuine interest in our goals and how we can best achieve them and he has become far more than our accountant and tax advisor, we hope we continue the relationship in the same vain over the next 10 years. Having Gartly and Associates led by Geoff Gartly and his wonderful and dedicated staff handling my sometimes complicated tax returns, assures me that I am getting the best possible advice and results to prove it. I have no hesitation whatsoever in recommending the team to all my friends and associates. Keep up the good work. It's nice to know that Fay and myself are appreciated by the team. THANK YOU Geoff, Vanessa, Kathryn and all the team at Gartly & Associates. You guys have been a god send with assisting us throughout the year/s. I feel we have come a long way and definitely have achieved a milestone the past 6 months and am so happy we’re finally growing as a business. I could not more highly recommend Gartly & Associates whom I have been using for the last 8 or so years since my previous accountant retired. Geoff, Vicki and the team offer exceptional friendly service at a reasonable price. I am a property investor with 5 properties as well as PAYG income, and their advice and service to me has been invaluable. Couldn't more highly recommend this wonderful family owned business. The team at Gartly & Associates treat us like family - very friendly and helpful. No question is too hard and no request is too difficult. Their expert advice is at our fingertips and they always get back to us when we call for help and advice. This provides us with such peace of mind to have accountants and staff who really care about us and our accounting needs for our business and private matters. Geoff and Team - thank you for all your expert advice and assistance. Everyone who knows me knows my head is always in the clouds. Geoff and his friendly team of professionals do a fantastic job of looking after the parts of my business I don't make the time for. I cannot recommend them highly enough. I initially approached Gartly and Associates following a referral from a friend. On our initial free consultation Geoff asked me several questions many of which I had not even considered relating to our business and retirement planning. It was a light bulb moment. Geoff Gartly's knowledge and expertise in small business enabled us to expand our business. We have found all of their staff members very approachable and easy to deal with. I highly recommend Gartly and Associates and have done so many times to others who are also happy with their services. I am a sole trader and have been working with Gartly and Associates for 6 years now. I find Geoff and the whole team to be incredibly professional, efficient and courteous. They are always responsive, and particularly understand my needs as a sole trader. They work with me and understand all of my needs and issues. I highly recommend them to any small business or sole trader. Geoff, Vicki and Team have been fantastic! We had a couple of difficult years, where apart from our usual business needs, we had a very complex family money situation to resolve. Geoff worked with our Solicitor to help us sort it all out. It was a long and difficult job. Geoff’s happy face, always made working with him a pleasure. His team are friendly, competent, and professional. Gartly and Associates are a friendly and efficient firm. Our financial affairs have been well looked after and we have been given sound advice. Dealing with Gartly and Associates has been a pleasure. We have recommended their services to friends and will do so again. Our work with Geoff and his team aimed to increase our internal financial business benchmarking to accurately monitor changes in our process and systems and rate each change. Geoff’s recommendations now enable real time monitoring of our efficiency and have allowed us to make more informed business decisions. A result beyond our expectations in terms of cost savings and the speed with which we accomplished our goal. What we appreciated most about working with Geoff and his team was their ability to cut through the noise and focus on the important stuff. I have been receiving service from you guys from the last 8 years and I must say that its more than exceptional. I enjoy the great customer service every time I come into the office or ring up to speak to you guys. Your knowledge of the current market trends is exceptional and the way you guys handle my financials is exceptional. Ever since you guys have started looking after my business, I am a lot less stressed and I worry less. Geoff has been a valuable partner in helping grow my business from a start up and in advising on things as diverse as super to workers comp, cash flows and investments. Highly recommend as a professional and personable member of the profession and community. You can't go past an accountant who reads the Tax Act for pleasure. Geoff Gartly does exactly that and is a guy you want to have on your side. My involvement with Geoff, Vicki and the team at Gartly & Associates goes back 15 years. Initially providing tax return services for my wife and I, and then seven years ago assisting me to establish a Family Trust and my own sports and recreation planning business. Through each of these phases, the service, advice and knowledge-sharing has been fantastic, particularly to a self-confessed 'non-numbers man'! Geoff and the team at Gartly’s helped us restructure our business to be better suited to our growth in the commercial construction sector. They continue to offer us ongoing support & advise and Geoff always makes himself available to guide us with our trickier business decisions to ensure the best financial outcome. Since joining Geoff and the team at Gartly & Associates, our business has gone from strength to strength. With Geoff’s excellent guidance we have been able to not only grow our business like never before, but also run it much more efficiently! His guidance also has us planning for a financially independent future. We would strongly recommend Gartly and Associates to anyone! GREAT BUSINESS ADVICE! I have been associated with Gartly & Associates for the last 18 years of my business life. Geoff has been invaluable to our decision making going forward as well as great tax advice along the way. 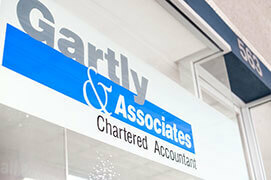 I have no hesitation in recommending Gartly & Associates for all your accounting needs.